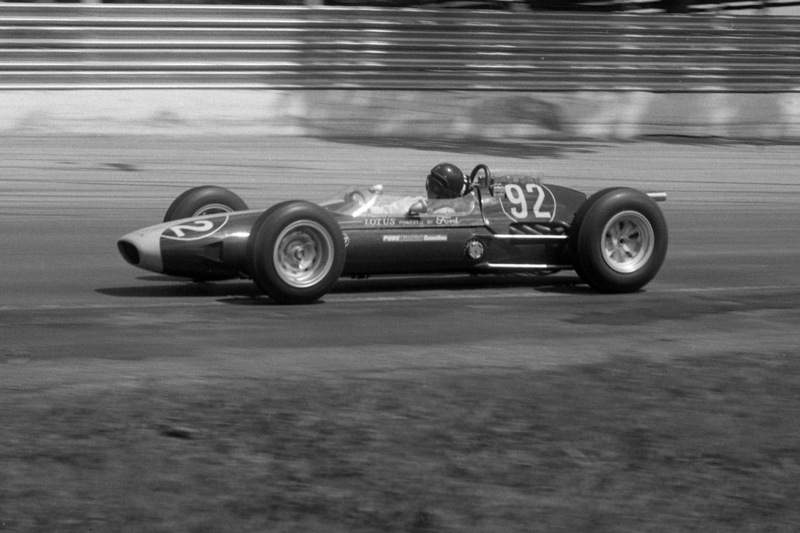 With that excellent Milwaukee July test behind him (see “Jim Clark, Delicately Poised”), Jim flew with Dan Gurney and Colin Chapman to Chicago on Wednesday, August 14, 1963, for the 200-mile Tony Bettenhausen National Championship Classic – Jim’s second oval race in America. 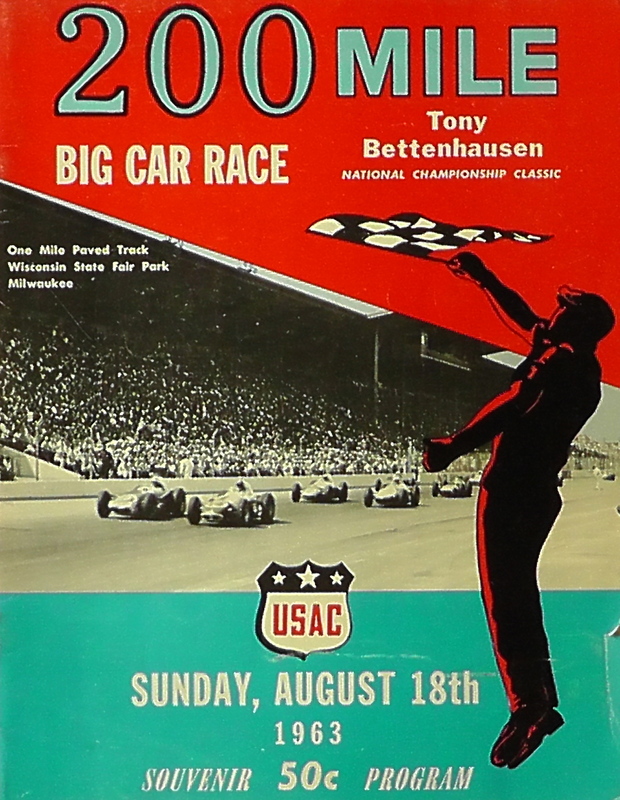 The Milwaukee Mile was already a part of American racing folklore and this race, the biggest of the year on that track, was named after the superquick Indy driver who had died in a testing accident at Indy (caused by a suspension failure) in 1961. 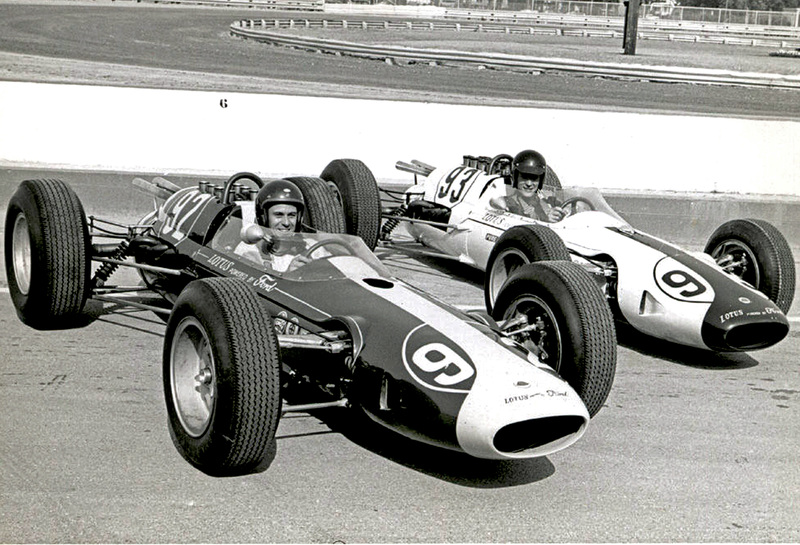 By now, the Lotus 29-Fords had become the major talking-point in American racing circles. Jim hadn’t won Indy; and many, amazingly, remained front-engined proponents, AJ Foyt and Parnelli Jones firmly amongst them. 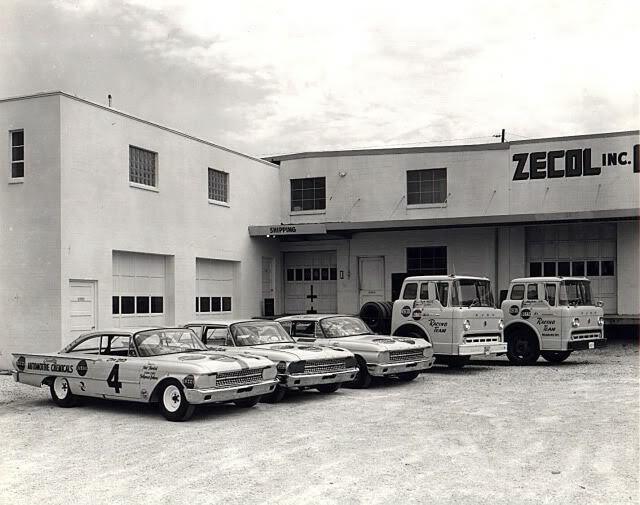 On the other hand, the might of the Ford Motor Company was now pouring money into its race programmes, and it was no secret that several customer teams would be chosen for 1964. The American view at the time was that Ford were allowing Lotus – “those British guys” – to build a car around the brilliantly-developed 4.2 litre V8 pushrod engine. Key American journalists even referred to Jim’s car as a “Ford-Lotus”. For his part, Jim was happy to go along with it all. Although he could live without the attention and the fanfare, he was impressed not only by the challenges of racing in America but also by the prize-money. He expected nothing on a plate – but he liked the idea of being rewarded for a job well done. This was in stark contrast to Europe’s start-money system, which engendered reasonable retainers for the drivers but relatively small prize funds. All this is relatively well-known. Much more difficult to find are photos from that Milwaukee race. I wrote, therefore, to David Hobbs, the very quick and successful British driver who today lives with his family in Milwaukee. David recommended that I contact his dear friend, Russ Lake. Although not a professional in the sense of relying solely on motor sport for his livelihood, Russ is by any standards a “true pro”. He has eaten, slept and captured American motor sports on film for going on 50 years. And, yes, he had some pictures from Milwaukee, 1963. You can see them here – Jim accepting his pole award, or in the car, side-by-side with Dan. Jim in the pit lane. Jim mid-corner, head leaning to the left, arms nearly straight. Study them closely. Remember that the Clark you see here is the driver who has just won the Belgian, Dutch, French and British Grands Prix, has finished a fighting second at the Nurburgring, and who has flown to the States almost directly from his win in Sweden. Look at his Westover driving shoes – slightly tatty and worn from driving the Lotus 25s, the Galaxy, the Lotus 23Bs and the Indy Lotus 29s. He wore his Hinchman overalls in Milwaukee – minus Firestone logos – and raced with his now-customary peakless Bell (unlike Indy, where he wore the white peak). 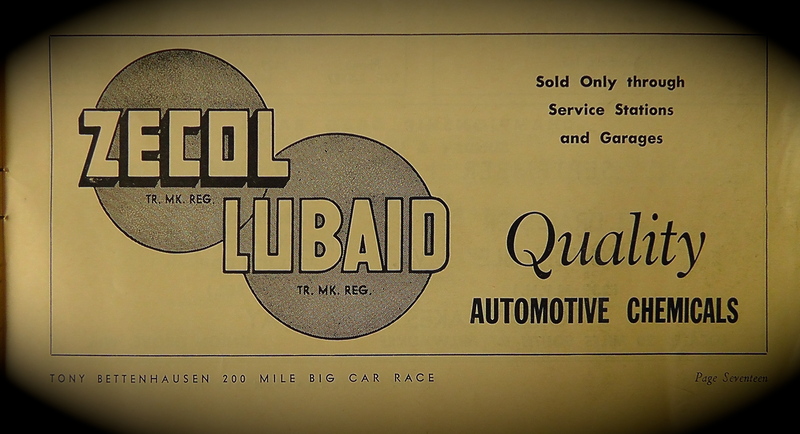 Note, too, the “Pure Firebird Gasoline” stickers on the sides of the cars (instead of the Pure roundels), the gauze filters over the carburettor inlets, the pad taped to Jim’s headrest to support his neck and the Dunlop wheels on the front (and Halibrands on the rear). All these details were different from the Indy spec; and – again – a big thanks to Russ Lake for enabling us to see them – in my case certainly for the first time. Jim’s winnings totalled $44,225, boosted massively by the lap prizes on offer from such companies as Augie Pabst Motors, Flambeau Motor Repairs, Hoosier Beer Cats, Datsun, Golden Slipper Lounge, Dunkels White Oakes Inn, Zecol Inc, Banner Welder Inc, Baumgartner Imported Cars and Ben Shumow Used Truck Sales. In addition, Jim received winner’s bonuses from Autolite, Champion, Monroe and Willard Battery. Below, I’m delighted to be able to embed some video footage of that 1963 Springfield race, complete with glimpses of Jim, Dan and Colin having fun in the paddock area. You’ll see them at the start and then there’s another shot of Jim near the end, stop watches in hand, absorbed by the proceedings. 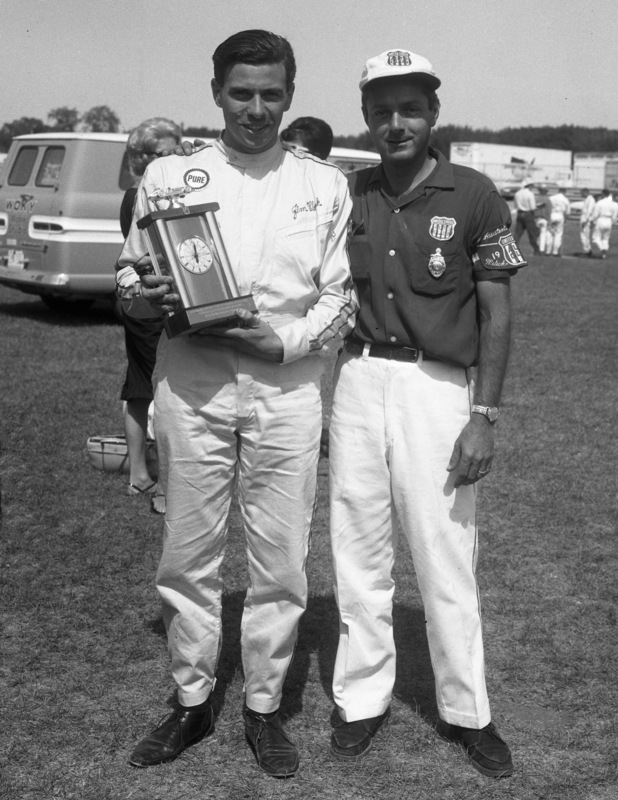 He was close to AJ Foyt and to Rodger Ward, and so he would have enjoyed this race immensely. Note his official pass, dutifully worn, and his Lotus green polo shirt. (Only the first half of the video is from Springfield but I recommend you watch it in its entirety.) 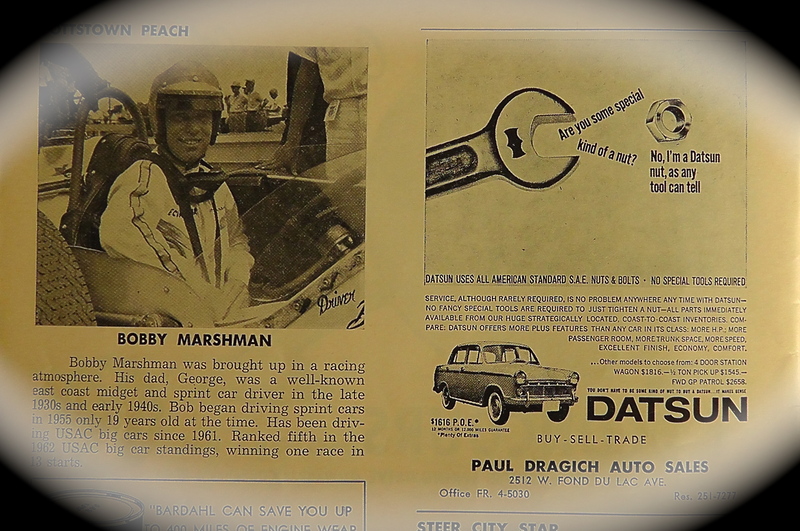 Watch, too, for the brilliant Bobby Marshman. He’s at the start of the video, showing Jim and Dan around his sprinter, and he’s out there, leading the race, when his engine fails. 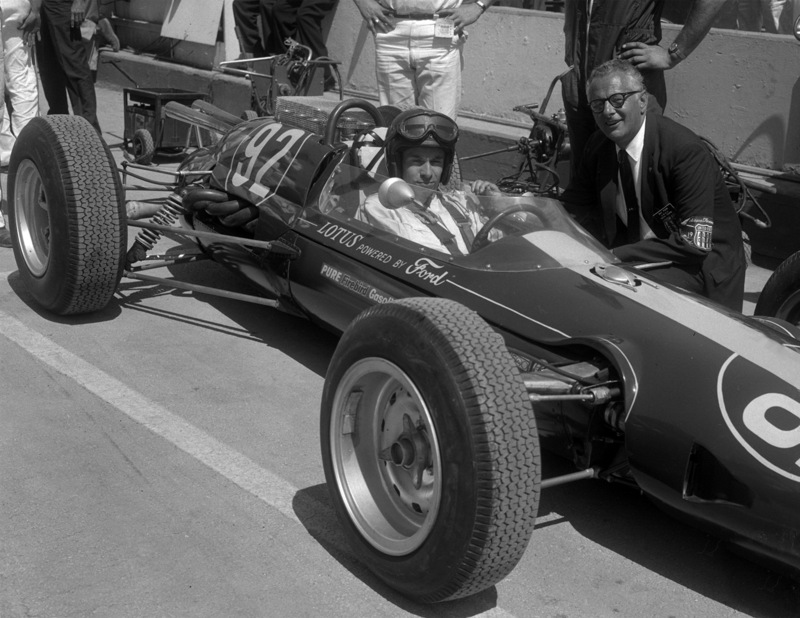 He impressed Jim and Colin, of course, and the following year he would race Jim’s 1963 Lotus 29 at Indy (repainted red-and-white, sponsored again by Pure and entered by Lindsay Hopkins). Bobby led Jim in the 500 before running a little too low on the banking and damaging the sump plug. Chapman thereafter resolved to include Marshman in upcoming Team Lotus US race programmes and perhaps even to give him an opportunity in Europe. Very sadly, though, Bobby was killed in a Firestone testing accident at Phoenix late in 1964. Windsor pulls out all the stops this time. What a magician ! Fascinating. Lets lay down dirt at Spa. That dirt track racing looks terrifying to me. Interesting about the carb choice on Gurney’s car. To go 10mm bigger on body size is a huge jump that I do not think could be made up in choke tubes as Weber do not do that big a spread in sizes. It’s like taking a pair of 48 DCOEs off a full house BDA and putting them onto a standard S.E. spec Lotus twin cam and trying to choke them back down to run properly. Weber do not make tubes small enough, and even if you turned some up the results would hardly be satisfactory. So assuming that 48mm bodies were the ideal, were Gurney’s fuelling issues caused by having to use carbs too big for the application? Interesting (well at least it is to me! ), but once again, more stuff I did not know, many thanks!